This is a more powerful version of Car Wash Calendar, with all of the features of the standard version, but with the additional capability to share data in real time over the network. A comprehensive solution, the program allows creating the database and events planned. It is absolutely essential for coaches, fitness instructors, aerobics instructors, group exercise instructors, fitness coordinators, scuba diving instructors, trainers and team leaders, as it provides them with a tool to organize the business and to manage it effectively. It’s perfect for coaches, instructors and trainers to plan working hours so that the practice or lessons do not overlap with someone else and keep track of scheduled appointments. It’ll store the information about clients, such as their address, health and emergency data, personal notes, family data, membership fee and renew dates, comments. Add as many comments as you wish. But just imagine how wonderful it would be, to have at hand all the information you need! That’s when the program comes in especially handy. The program gives you a customizable Date Navigator and comprehensive reminder. It’s highly flexible, allows changing time intervals, creating numerous profiles and viewing multiple schedules at a time. For those people, who work in Microsoft Outlook, it’s possible to export data. Export of data is available to different formats: XLS, TXT, HTML, XML for its adaptation for other programs. Reports can be exported to PDF files. You can easily customize various export, pagination, and document settings via a built-in PDF Export Options form. When you need a printout of your schedule, you’ll certainly appreciate the powerful Print Designer. It’ll help you to print your schedule in the most convenient form, choosing from a number of templates. In case of crashes or virus attacks, there is an auto backup function with a possibility to remove old archives automatically. Powerful software to make your business more efficient! A comprehensive solution, the program allows creating the database and events planned. It is absolutely essential for coaches, fitness instructors, aerobics instructors, group exercise instructors, fitness coordinators, scuba diving instructors, trainers and team leaders, as it provides them with a tool to organize the business and to manage it effectively. It’s perfect for coaches, instructors and trainers to plan working hours so that the practice or lessons do not overlap with someone else and keep track of scheduled appointments. It’ll store the information about clients, such as their address, health and emergency data, personal notes, family data, membership fee and renew dates, comments. Add as many comments as you wish. But just imagine how wonderful it would be, to have at hand all the information you need! That’s when the program comes in especially handy. The program gives you a customizable Date Navigator and comprehensive reminder. It’s highly flexible, allows changing time intervals, creating numerous profiles and viewing multiple schedules at a time. For those people, who work in Microsoft Outlook, it’s possible to export data. Export of data is available to different formats: XLS, TXT, HTML, XML for its adaptation for other programs. Reports can be exported to PDF files. You can easily customize various export, pagination, and document settings via a built-in PDF Export Options form. When you need a printout of your schedule, you’ll certainly appreciate the powerful Print Designer. It’ll help you to print your schedule in the most convenient form, choosing from a number of templates. In case of crashes or virus attacks, there is an auto backup function with a possibility to remove old archives automatically. Powerful software to make your business more efficient! LUKLA TO EVEREST is the first in an exciting new series of Garmin-compatible digital maps covering the major trekking and climbing regions of Nepal and the Himalaya. TrekMapGPS products install on a PC for uploading to your GPS unit. The maps can be previewed in Garmin?s MapSource (not included) or other compatible software for route planning or reviewing. Upload to your GPS using MapSource or an upload utility such as SendMap20 by cGPSmapper. Plan your trip using Garmin?s Trip & Waypoint Manager or other compatible software. Compatible GPS units include GPSmap, eTrex, Quest, Rino and zuno models. Over 600 searchable Points of Interest (POIs), including: 120+ towns and villages (?City? searchable), 275+ elevation spots, 20+ passes, 60+ summits, 50 glaciers and nearly 250 lakes, schools, hospitals/clinics, places of worship, airports and other places of interest, bridges and other man-made objects, 100+ miscellaneous labelled locations, 60+ accommodation areas and campsites. Contours at 40m / 200m / 1000m intervals. All major trekking routes, tracks and paths. Rivers and streams. International and National Park borders. Please note: the map is not routable. E86?36.750′ to E87?02.507′, N27?37.077′ to N28?06.052′ (Gokyo summit in the west to Baruntse summit in the east, 1.7km south of Lukla to 6km north of Everest summit). Lukla, Namche Bazaar, Tengboche, Pangboche, Dingboche, Chhukhung, Gorak Shep, Gokyo. Everest, Lhotse, Nuptse, Pumo Ri, Baruntse, Ama Dablam, Kangtega, Peak 41, Kusum Kanguru, Taboche Peak, Island Peak, Kangchung Peaks. A small sample area of the map is freely downloadable from for perusal and compatibility checking if you have any doubts before purchasing the full product. Full installation instructions are included. ANNAPURNA REGION is the latest in an exciting new series of Garmin-compatible digital maps covering the major trekking and climbing regions of Nepal and the Himalaya. TrekMapGPS products install on a PC for uploading to your GPS unit. The maps can be previewed in Garmins MapSource (not included) or other compatible software for route planning or reviewing. Upload to your GPS using MapSource or an upload utility such as SendMap20 by cGPSmapper. Plan your trip using Garmins Trip & Waypoint Manager or other compatible software. Compatible GPS units include GPSmap, eTrex, Quest, Rino and zuno models. – 120+ accommodation areas and campsites. Contours at 100m / 500m / 1000m intervals. All major trekking routes, roads, tracks and paths. International and National Park borders. Please note: the map is not routable. (extending beyond Beni in the west and Tal in the east, beyond Pokhara in the south and Kagbeni in the north). Pokhara, Jomsom, Chame, Besi Sahar, Kusma, Tatopani, Baglung, Beni. Annapurna, Annapurna II-IV, Annapurna South, Nilgiri, Chulu, Kang Guru, Tukuche Peak, Pokharkan, Chhubche, Purkhung, Machhapuchhare, Pisang Peak. A small sample area of the companion map, Lukla to Everest, is freely downloadable from for perusal and compatibility checking if you have any doubts before purchasing the full product. Full installation instructions are included. Nimmer’s DivePlanner v. 2.0. Plan your dives and log them. Lets you plan up to three successive dives, view your DiveProfile, Log your dives and more. Restrictions Unregistered version: You can use the program for 30 days or 10 times before registration. Pedometer Log provides a means to record your daily steps for a year. It will also convert these steps to miles or kilometers and calculate the number of calories (kcal) burned while walking. You can also see a graph of your daily or weekly totals. Racer Log can significantly improve your training if you spend only a few minutes a day maintaining a training diary. This may be the most helpful and informative tool you’ll ever use because you enter the information yourself and it will only be as good as what you put into it. Is your performance improving? If not, why not? If it is, then what made the difference and is there room for even further improvement? On a daily basis, you can enter your energy level, hours of sleep, pulse, blood pressure, and weight. Every activity includes space to enter information on intensity, distance, duration, speed, cadence, altitude, pulse, and weather. Racer Log can also track race performance, route notes, and other summaries. Until you measure what type of improvements you’ve obtained from training, you won’t know whether to retain or modify your training regimen. Weekly, monthly, and yearly charting of distance, duration, and speed will help you make the these decisions. Bicycle Gear Calculator is a very powerful application for serious cyclists. It will not only calculate a bicycle’s gearing, but will also save the information for later retrieval. Measure the wheels, enter the gear numbers, and Bicycle Gear Calculator will calculate the gear ratio’s. The measurements can be made with inches or centimeters, and can be displayed in both, as well as in US and Metric Standard Gearing. Enter the cadence and it will display the Estimated Speed in mph or km/h. Calculating the proper spoke length is a key step in building a bicycle wheel. 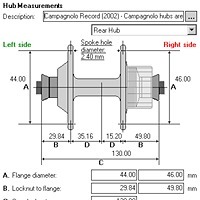 This software will help both professional and home mechanics calculate the spoke lengths needed for any hub and rim combination quickly and easily. Please note this is NOT a ‘How to’ for building bicycle wheels, however some excellent sources are listed in the reference section. All measurements are in millimeters, and the calculated spoke length is corrected for spoke stretch.